I am wrapping up wedding week with every DIY wedding idea you ever wanted to see. 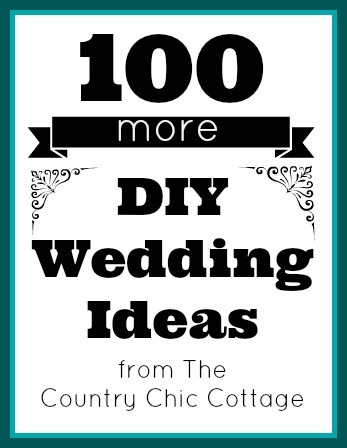 A list of over 100 DIY wedding ideas for you to grab tons of information and inspiration. Grab a cup of coffee and get started on this ultimate list of cheap DIY wedding ideas. Some links below may be affiliate links which means that you do not pay anymore, however, a portion of any purchase will go to this site. Feeling overwhelmed? Try purchasing a wedding planner to jot down the ideas you find below. You will thank me later! I am going to start with some links to get you inspired and set the theme of your wedding. Then there are tons of ideas on how to make your own elements for turning that inspiration into reality. Enjoy! Whew what a list! For even more great wedding ideas, be sure to follow my wedding board on Pinterest. Plus bookmark or pin my wedding gallery page as my new ideas get put there as they are published on my blog. I hope you enjoyed my ultimate list of DIY wedding ideas and that now you are inspired to make your own DIY wedding. Want to see pictures of some great DIY wedding ideas? Check out the video for 100 DIY wedding ideas! Need more ideas? Yep I have 100 MORE DIY wedding ideas here! What a list!!! Thanks for including my love blocks! Thanks for including me Angie! Thank you for including my single bloom fabric bouquet! Thanks so much Angie! What a great roundup!